Name variation: Rosenborg Studios / Rosenborg Studio(s) Norway. Recording and mastering studio in Norway. The studio was named after its location, Rosenborggaten 19 in Oslo. Lacquer cuts can be identified by a 710 in the runouts, on releases from 1970 to 31 December 1983. The studio used Neumann cutting equipment. All releases in between this period, with 710 in the runouts was cut here. The P + two numbers in the string, example: MCF 3104 A 5 P 81 F 710 , indicates the year lacquer/vinyl was made as the earliest. Ivar Finsen 1970 - 1983: F ( identified by a stamped F in runouts. Also see profile for his etched initials). Missing information on engineer with stamped "N" : ?? The studio was founded in 1970 by A/S Nor-Disc and Norsk Phonogram A/S, who collaborated on the technical facilities in their branches around the world. The companies already had a vinyl factory in Norway (Musikkindustri A/S), but they wanted to have control over the entire technical production to ensure a high quality level. 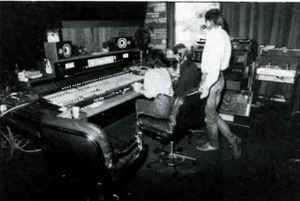 The cutting equipment was sold to Roger Arnhoff Studio in 1984, and again in 1985 to Sun Studio, Copenhagen. Later, the equipment was returned to Oslo for storage, and after some time sent to Rockheim museum in Trondheim, where it can be seen today. If pressings exist after 1985 carrying a PolyGram related 710 stamp, then the explanation is that some mother stampers with 710 from Musikkindustri A/S, was stored at PRS Hannover. Example for P 82 (1982) stamped runout from Rosenborg Studio, but Made in Germany and dated 1985. By April 1984, PolyGram closed down nearly all technical operations in Norway and the studio is taken over by Svein Sundby. Arrangements are made with Slagerfabrikken, driven by Jan Paulsen and Audun Tylden. Sundby was the studio manager until 1987. In the 1990s the name was changed to Majorstudio. Rosenborg Studio was used for most types of music productions: From classical and small ensembles, through gammeldans, jazz and musicals, to folk songs, pop and hard rock. For example, several of the 1970's major musical productions was made virtually live here with up to 40 musicians in the studio at once.